US, 1946, 89 minutes, Black and white. Randolph Scott, Ann Dvorak, Edgar Buchanan, Lloyd Bridges, Rhonda Fleming. Directed by Edward L. Marin. 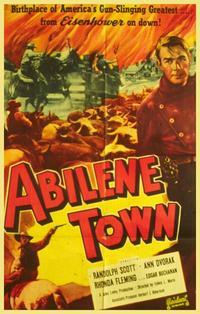 Abilene is in the title of quite a number of westerns. It was the town in Kansas which was the end of the trek from Texas for the cattlemen and their selling the cattle for meat for the eastern states. After the Civil War, it was a mixture of organisation and chaos. The cattlemen exploited the saloons in the town. These were typical salons, with musicians and singers, here led by Ann Dvorak. She has a feisty presence. And there is a balance with a performance by a young Rhonda Fleming as the daughter of a merchant. A young Lloyd Bridges appears as one of the leaders of the settlers. Edgar Buchanan is the cowardly county marshall. However, this is a Randolph Scott western. After appearing in musicals and action films in the 1930s and early 1940s, Scott made a transition to westerns and from this period until his retirement in 1962, he appeared solely in westerns. In this one he offers a typical performance as a Marshall. 1. A classic Randolph Scott western? From the mid 1940s? At the beginning of Scott’s career solely in western films? 2. The setting of Abilene, the introductory explanation, cattle from Texas, the 1000 mile trek to Kansas? The stockyards of the Abilene, the railhead? The 1870 setting? The fights with the settlers? 3. Black and white photography, the west and countryside, the town of Abilene, the main street, the saloons on one side, commerce on the other? The interiors of the saloons, the shops, the homes of the homesteaders? 4. The musical score, the range of songs and performance, choreography? Rita and the chorus? 5. Randolph Scott as Dan, his past with cattle, their destruction, his being made marshall? His taking responsibilities seriously? The merchants and their support of him? Sherry and her liking for him, pleading for him to resign? His attraction to Rita, watching her perform? His reaction to the cattlemen, the guns, riots? Charlie and the saloon, confrontations with Dan? His relationship with Bravo, the county marshall? The attempts on his life, the shootouts in the saloon, and the interrupting of the songs? 6. Cattlemen, the head, stand-ups in the saloon? The money they brought into the town? The merchants and their weighing up the profits from the cattlemen and from the farmers? 7. Jet Younger and his coming to town, in the pay of Charley, leading the posse against the farmers, burning the barns and homes, the killings? His getting out of the town, Bravo and the posse, their leaving in the night, Bravo and the signal to Jet, his tying up Dan, returning to town, playing cards? Dan and his confronting Jet, the fight, getting Bravo to bring him in, becoming a hero, for the votes? 8. Bravo, all talk, the county, avoiding any action, playing cards? The posse, tying up Dan, back to town, and Dan persuading him to bring in Jet? His speeches, campaigning? The farmers lining up behind him? 9. The settlers from Ohio, the big group, the issue of land, government land, their homes, putting the barbed wire, sold to them by Sherry, in the path of the cattle? Thier breaking through? 10. Rita, antagonism towards Dan, kicking him, her songs in performance, investing in the saloon? Destruction, trying to stop Dan going with the posse, his putting her in the cell? The final reconciliation? 11. Henry, young man, earnest, leading the settlers? Attracted to Sherry? Buying the barbed wire, her father refusing? The cattle breaking through, his sense of defeat? Organising more settlers to come, the stance and the town? Dan and Sherry, and letting Sherry go, the happy ending for Henry? 12. The buildup to the confrontation, Dan taking charge, lights out in all the saloons, the cattlemen arriving, barging into the saloons, causing mayhem, drinking? The merchants and their standing with the settlers, the confrontation and the cattlemen leaving? 13. An interesting picture of the west, 1870, transition in Kansas from cattle to farming?